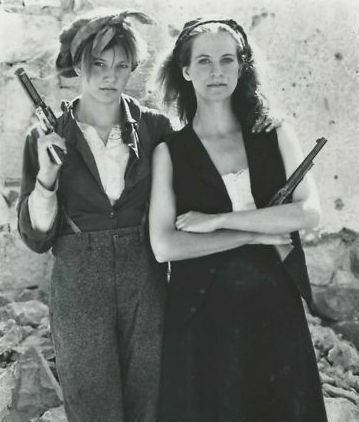 "Cattle Annie was an outlaw, with a dime novel dream..."
If you can find it, I recommend a volume of film reviews entitled Produced and Abandoned (published by the National Society of Film Critics), which collects pieces about movies that may have had critical success, or at best cult audiences, but remain largely unknown to the general public. Among the reviews (featuring works by many authors) is a piece by Peter Rainer about a 1981 western entitled Cattle Annie and Little Britches. Rainer's prose is devoted less to the film itself, and more to a lengthy tirade about the governing powers that prevent movies from ever finding their rightful audiences. I wished that he had spent more column space on the virtues of the movie, especially since interested readers could at least vicariously learn more about a film that they may never see- however his review is a cautionary tale about how the life of a film can be ruined by insensitive execs, and is no more true than in our current climate, where films must open wide to maximum screens instead of slowly building an audience. 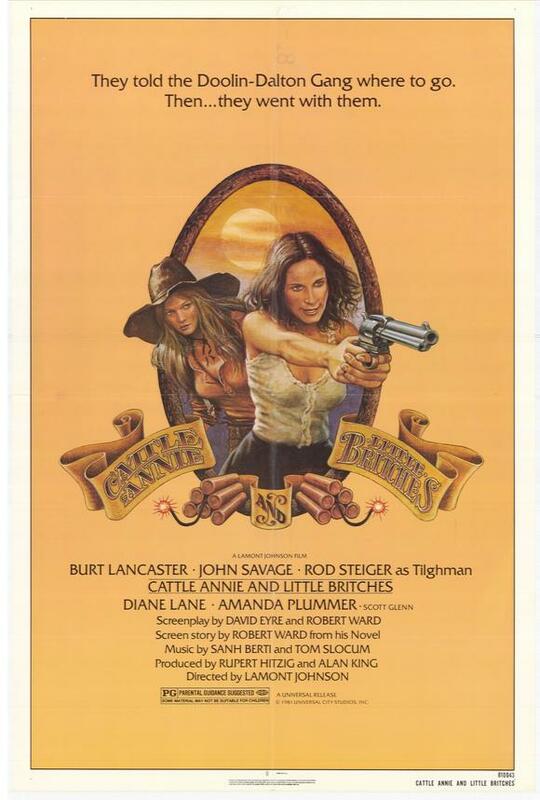 Indeed- thirty years on, after Cattle Annie and Little Britches was acquired by Universal, and summarily dumped after only a scant few playdates (despite even receiving a warm review from Pauline Kael), the film has never been on home video. Luckily, I managed to see this little gem twice on television circa 1983-84, and to this day remember fondly its quirky charm. In the conclusion of The Man Who Shot Liberty Valance, there is the truthful adage: "When the legend becomes fact, print the legend." Our film centers on a young woman who has succumbed to that process. Clearly enamoured in the exaggerated over-romanticized tales of western outlaws that were published during the frontier days in dime novels (popularized by such writers as Ned Buntline), Cattle Annie is dismayed to find that her revered Doolin-Dalton gang is somewhat less than their larger-than-life depictions in those dime novels. With her young sidekick Little Britches, she joins the gang to re-instill in them the glamourous life of the outlaw that she idealizes. Scripted by David Eyre and Robert Ward (from Ward's own novel), production for the movie began in the late 1970s, and although it was released (albeit haphazardly) in 1981, Cattle Annie and Little Britches belongs with the many so-called "old man westerns" of the 1970s. Films as diverse as The Wild Bunch or The Shootist featured their aging stars as frontier men well past their prime who attempt one last hurrah before fading away completely into changing times. In this case, Burt Lancaster, in his 60s, appears as Bill Doolin (although his real-life counterpart only lived to be 38), who attempts to keep together the fledgling Doolin-Dalton gang after their disastrous 1892 robbery in Coffeyville, Kansas. The actor made a tremendous post-senior-aged comeback in the 1980s with Atlantic City, Local Hero, and Field of Dreams, yet this film shows evidence of what was to come, as he is marvelous as a gentlemanly Victorian Doolin who is persuaded by the passions of Cattle Annie. John Savage and Burt Lancaster. Another veteran, Rod Steiger, is cast as the marshall Bill Tilghman (the actor's resemblance to the real-life frontier lawman is uncanny), and gives one of his rare low-key, controlled performances as the lawman who is constantly thwarted by the outlaws, and befuddled by the public's admiration for their romanticized ways. The film is rounded out with younger stars John Savage and Scott Glenn (the latter as Bill Dalton), but it is especially notable for stars-to-be Diane Lane (in her third film) and Amanda Plummer (in her first). In her debut, it is clear that Plummer was going to go places. She jumpstarts her future career in unusual roles, and she is simply astonishing as Cattle Annie, whose passion to restore the outlaw gang is enormous. This is also a career highlight for director Lamont Johnson, who always excelled in character-driven movies, such as The Last American Hero, and another underrated western, A Gunfight. While the script is fine, and there is enough action to satisfy the western fan, one most remembers the interplay among the cast: the love and humour displayed between the characters is what makes this lyrical film really shine. Thirty years is long enough for people to discover this movie for the first time. Or for those who were fortunate to catch it during its fleeting dates in the 1980s, a long overdue reunion is welcomed. Universal clearly didn't know what they had- this marvelous picture needs to be unearthed now!